A couple of months ago, my hubby surprised me with tickets to see Wicked. He knew it was my all time favorite musical so when they announced they were coming in town, he decided to surprise me by purchasing a pair of tickets. We saw it again last night. Although, I have seen this musical before and I have heard the sound track countless times, it was as though I was watching it for the first time again. 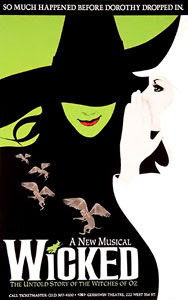 The music gives me chills, especially the song, "Defying Gravity." I simply love the lyrics and music. If you have never seen it and were ever thinking about going, I say go for it. It is absolutely fantastic and it is one that I would definitely see again.